The move-on period refers to the 28 day period following grant of refugee status, in which individuals must leave their asylum accommodation, acquire documentation and access housing and welfare benefits. All refugees find this stage highly stressful due to the lack of information, inability to access appropriate service, delays with paperwork etc. The resultant risk of homelessness exacerbates existing vulnerability and in some cases, triggers a mental health crisis. A number of individuals do not get everything sorted before the initial 28 day time period is up due to systematic delays and a number of other challenges, including the current lack of integration services specifically aimed at refugees. After this 28 day period, even if housing, benefits and other essential provisions are in place, the challenge doesn't stop there. Indeed, there is also currently a lack of holistic or personalised support to support refugees beyond these immediate or basic needs towards wider social and labour market integration. Further, challenges can also arise later on in someone's time as a refugee such as employment problems, housing problems or other personal problems which can lead to destitution. 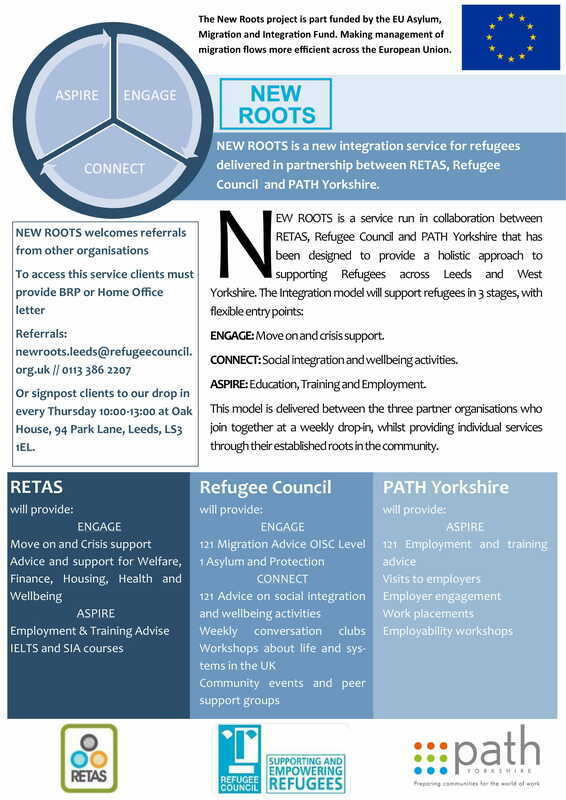 Refugee Education Training Advice Service (RETAS) helps refugees with Move On and Crisis support, along with Refugee Council, through the Engage part of the New Roots Project. Engage supports clients with both move-on and post transition support. Refugee Council also support with specialist OISC Level 1 advocacy and targeted therapeutic support.